Zurich delivers Design and Function, Aesthetics and Appeal. Take entertaining with family and friends to a new level. The performance, power and variable heat control of Zurich's burner plate defines multi-functionality. When not enjoying meat, cheese or chocolate fondue, use the separate burner plate as you would a stove top element. The Zurich is not just a fantastic fondue, it's so much more! 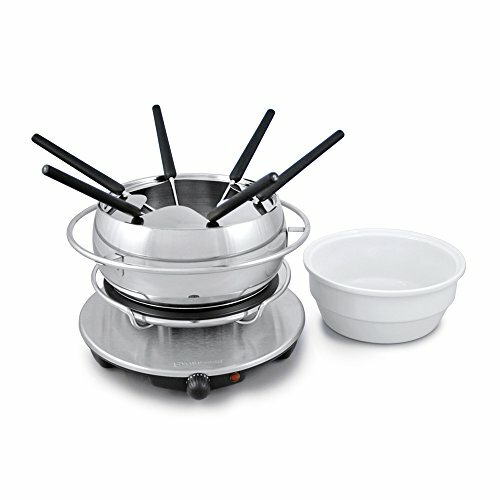 The Zurich Electric 11-piece Fondue Set includes a stainless steel ringed pot, a stainless steel spatter guard, a ceramic Bain-Marie insert, 6 fondue forks, a detachable magnetic power cord and a stylishly raised electric burner rechaud base with rails.